Other than competitor bid, map and control card are provided by the organiser, due to safety reason, athlete shall bring with compass and whistle. Control card or an electronic timing chip is a must for competition. If you take part in score event, you also need a watch. In terms of clothing, wear light, comfort, breathable and free for moving is the best. Clothing with fabric is too tight or thick make you move slowly. During sporting, body generate heat, do not wear too many clothing even in low atmospheric temperature. People with less hiking experience may wear walking boot to protect ankle. Experienced athlete may wear competition shoes. Generally speaking, shoes with water resistance, shoes sole with studs can prevent slipping on sandy and stony ground. Elite orienteering athlete wear light weight and breathable clothing and sheen guard, fast running in terrain need a light weight running shoes with studs or metal spikes, and also an eye protection glasses. Thumb orienteering compass is very useful for elite athlete navigate fast. Orienteering map is different from tourist map or street map, area description or name of place is not needed. Orienteering map must be able to describe in more detail of the ground surface conditions, it use contour lines to represent shape, height and relief of terrain. It use different colour to express the difficulty of movement and vegetation distribution. different map symbols represent ground surface features such as boulder, pit, building etc. It is to ensure that more details of the ground conditions provide a better understanding for a fair competition. To allow athletes who speak different dialect and read different languages can compete together, IOF developed a set of standard map symbols and control description symbols that is common to use around the world, that reduced the barriers of athlete from different countries on map reading. ISOM 2000 apply to classic orienteering competition with map scale of 15,000 and 1:10,000. ISSOM 2007 apply to sprint competition with map scale of 1:5,000 and 1:4,000. There are also mapping standard for Mountain Bike Orienteering and Ski Orienteering. 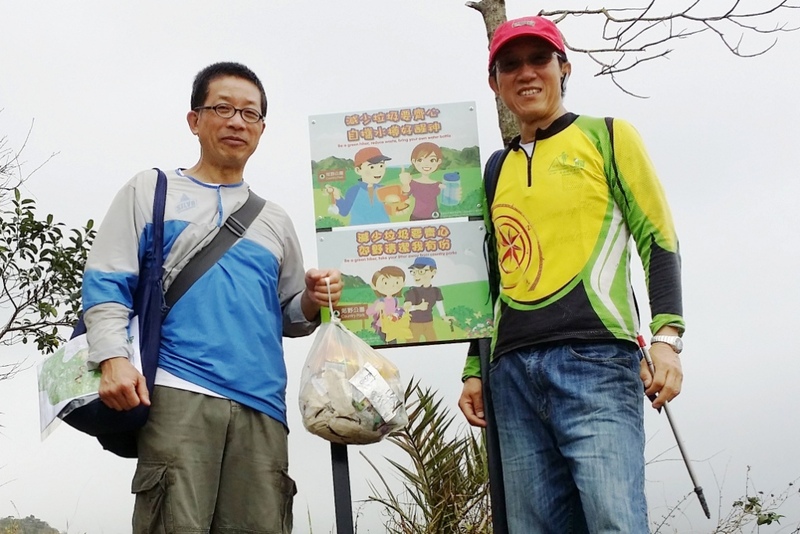 Competitions of Orienteering Association of Hong Kong also use IOF Control Description Symbols. Relationship of contour lines and relief of terrain Contour line line up together all area of the same height, the shape and density of contour lines represent the shape, the height and steepness of a mountain. Compass is used for navigation. It is a 'must' equipment in orienteering. Orienteering compass comprise a compass house with a magnetic needle and a protractor base plate with directional lines on it. There are also 'Thumb Compass' that wear on thumb which allows fast movement. To use it for align the map with the environment of the terrain, set the north line on the map to same direction of the magnetic north. Method: Turn the map on level so that the north line of the map is pointing to the magnetic north, which is the magnetic pointer in the compass is parallel with the north line on the map. This assist you to identify the forward movement direction. Method: Place a compass on the map, with the base plate connect position of yourself on the map and the destination, turn the compass and map together until the magnetic north of the compass align with the map north line. The compass base plate is not pointing towards the direction of your destination. During orienteering, you may get loss your location and is common for beginner. Keep clam and use the terrain and compass to identify the exact location on the map and then move forward to your destination. Set the map with your thumb pinpoint your present location on the map. The destination direction is the far side of the map. This help your to see the terrain environment and features on the ground. When you move forward, move your thumb accordingly. When you change your forward direction, turn the map and maintain the north of the map is towards the magnetic north. This will always keep you locate your position on the map and save you a lot of time. Use of compass to identify the direction of destination. Observe and remember of the terrain around the destination so that you can arrive your destination quickly. Use of obvious geographical or man-made linear features as a guide. This will increase confidence to use path, fence, stream spur as handrail. Identify geographical features that you encounter during your route, to assist you to the right direction and route. Be aware of using similar features but at incorrect location. Looking for an very obvious feature on the map near the control point as the target to be reached first, then use compass to help you to find the control point from the attack point. An attack point must be easily identify, such as pylon, path junction etc. Measure distance between two points on the map and then count the number of walking or jogging steps to finish the distance. Method: Count the number of walking or jogging steps for 100m, say 120 steps. When you need to go for a distance of 150m, then you need to walk or jog 180 steps. To minimize the measurement of steps, we always count on “double steps”, i.e. only count on either left or right foot, then your step count will be halved. In the example above, it will be 90 steps. When you move forward with use of a compass, off set your target direction slightly, and then use handrail to guide you to the destination from the off set target. Other than the basic techniques list above are commonly used, evaluation after competition to identify mistake and its reason can improve your orienteering skills. Beginners should put more time and effort on application of basic techniques. Armchair Orienteering, is described for an orienteer sitting on a chair and read a map and imagining the competition scene and the process of route selection. This is a common practicing skills for elite athlete for mental training. At the event centre, athlete register for a competition and collect competition number bid. Athlete may check for their start time and other relevant information at the event centre. Athlete has to arrive the start area 10 minutes before the start time. Usually starting area can be at a few minutes to 30 minutes walking distance from the event centre. Athlete has to allow sufficient time to walk to the start area without late. If athlete arrive late because of personal reason, there will be no compensated for time loss. Athletes of each class start at one minute or several minutes interval. Athlete who has started shall leave the start box immediately without blocking other athletes. During the competition, athlete punch at all designated control points and then return to the finish. Athlete run through a finishing funnel and pass a finish timer or punch at an electronic timing system, which record the finishing time. Return the map into a collection box and return the control card of electronic timing chip to the finish official to download the result for result processing and print out a result slip. Athlete may leave the finish area without blocking other athlete return to the finish area. Athlete can check for their result display on a result ladder and collect their map for souvenir. In general, any complaint or appeal must be submit within 10 mins after display of results. Athlete may leave after prize presentation. Orienteering is a very safe sport. During field survey for mapping and course setting, organiser will consider carefully all possible hazards that may affect or jeopardize the safety of athletes. Basically athletes are adequately protected during the competition. Although orienteering is a very safe sport, if you have never try it before, you should consult a professional orienteering club and qualified coach about basic orienteering techniques and knowledge. You may then enjoy the interest and challenge of orienteering with your friend and family. You can also go with your friends and family to the six orienteering trim courses set up in Country Parks. Orienteering is mainly organised in country side. All participants shall avoid damage the environment during the activities and also need to obey the Countryside Code. We request all participants bring away all materials after the activity, including rubbish and waste. We encourage recollect reusable materials such as metal safety pin, plastic bag, waterproof number bid, etc. After activity, take away everything you bring with, including any waste.